Washington state’s anti-Trump delegates played a leading role in a GOP convention drama Monday by trying to force a roll-call vote that potentially could have opened the door for delegates to reject Trump. CLEVELAND — From the moment they arrived, Washington’s delegation to the Republican National Convention was flagged as a potential troublemaker at an event meant to build unity around Donald Trump. 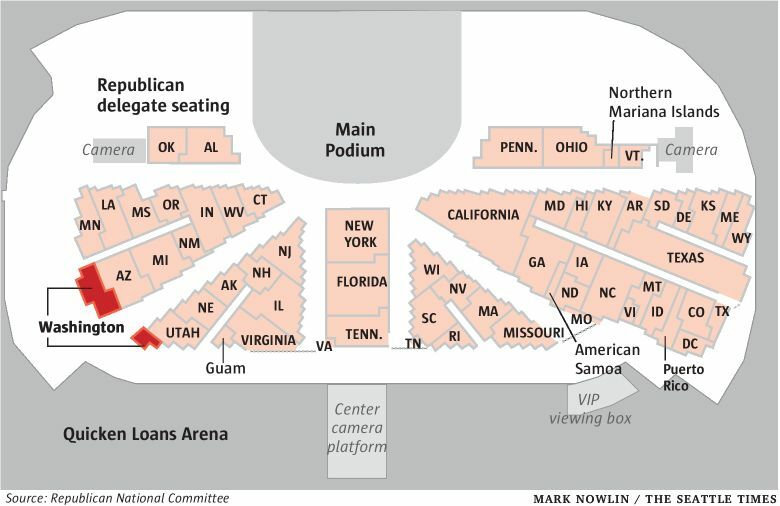 As one of the hotbeds of a last-ditch effort to “dump Trump,” the state’s 44-delegate contingent was relegated to a back-row, corner position in the Quicken Loans Arena, far from the stage where Trump is expected to formally accept his party’s presidential nomination Thursday. On Monday, Washington’s faction of anti-Trump delegates earned their rebel reputation, playing a leading role in a convention drama by trying to force a roll-call vote to reject the rules governing the event — potentially opening the door for delegates to reject Trump. As that effort was quashed by the convention’s presiding officer, Arkansas GOP Rep. Steve Womack, who ruled it didn’t have enough support, boos and shouts of “Call the roll! Call the roll!” erupted from dissidents in delegations including Washington, Colorado and Virginia. Trump backers and GOP loyalists shouted “USA! USA!” in an effort to drown out the rebellion. “That was a complete sham,” fumed Eric Minor, a delegate from Gig Harbor who had spent the last couple of days gathering signatures on petitions to demand the roll-call rules vote, which would have forced each state delegation to poll its members on the rules. Minor and some other delegates objected to rules saying they were required to support Trump based on state primary and caucus results. Womack determined the petitions were insufficient, saying some signatories had removed their names. Pro-Trump forces had lobbied delegates to back down, but Minor said he didn’t believe the signature effort had fallen short. “It’s a disgrace. It’s a miscarriage of justice,” he said. 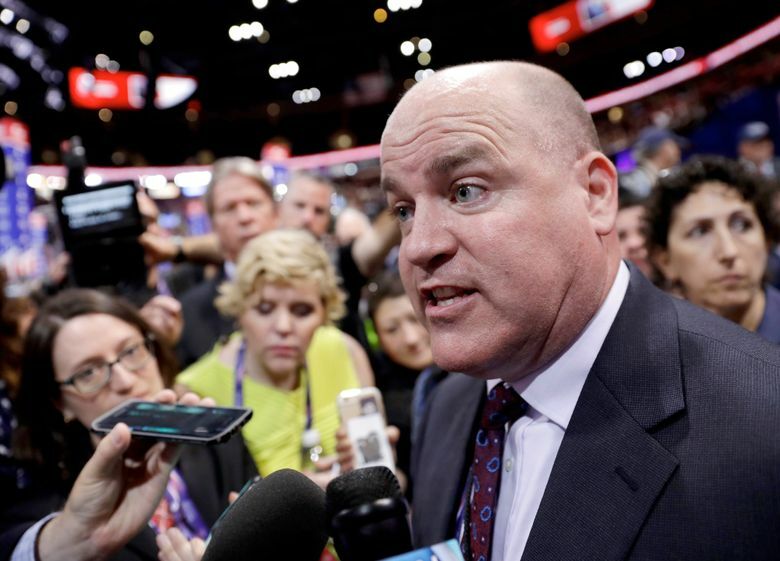 Minor was mobbed by national media as he continued to inveigh against the Republican National Committee, leading police and convention security in the arena to eventually demand reporters clear the floor. He said he had “no regrets” at his role in the convention fight, even if it embarrassed the GOP. Delegates from some states walked off the convention floor. Ken Cuccinelli, a leader of the conservative rebellion and former Virginia attorney general, ripped off his delegate credentials in protest. Susan Hutchison, chairwoman of the Washington state GOP, said the effort to force a roll call would only have dragged out the convention proceedings, with the same result: Trump as the party’s clear nominee. The New York billionaire entered the convention with 1,543 delegates — well above the 1,237 threshold required to secure the nomination. The anti-Trump sentiment is far from unanimous among Washington’s contingent in Cleveland. Seasoned state Republican leaders called the rules fight counterproductive and said the party needs to unite or risk sending Democrat Hillary Clinton to the White House. Dino Rossi, the former state senator and three-time statewide GOP candidate, refused to sign Minor’s petitions when the two came face to face in a line to get through security for a waterfront party Sunday at the Rock and Roll Hall of Fame. “Game over. This a two-person race,” Rossi told Minor. Trump’s Washington campaign director, state Sen. Don Benton, R-Vancouver, dismissed Monday’s floor fight as overblown. The opposition to Trump was led by Christian conservatives, many of whom had backed Texas Sen. Ted Cruz for the GOP nomination. Minor and others in Washington’s delegation fell into that camp. Trump easily won Washington’s presidential primary in May, which came just days after Cruz and Ohio Gov. John Kasich ended their presidential campaigns, clearing Trump’s path to the nomination. Nevertheless, Cruz’s organization dominated the state caucuses and convention, where the delegates to the national convention were elected. So as Washington’s delegates started their week at an assigned convention hotel in Middleburg Heights, a suburb about 15 miles southwest of downtown Cleveland, the atmosphere was not the usual pep rally behind the party’s nominee. At a morning delegation hotel breakfast, speakers including U.S. Sen. Cory Gardner of Colorado and conservative talk-radio host Michael Medved didn’t talk up the party’s nominee, though Gardner drew cheers and exclamations of “Yes!” when he said Republicans should agree on making sure Clinton doesn’t become president. In an interview, Medved, the Seattle-based host of a nationally syndicated talk show, said he hoped to hear enough from Trump over the next week to be able to support him. But he said that’s no given. If the start to the convention week was less than perfect for Trump, Hutchison sounded an optimistic note, saying the days ahead have been organized to build momentum for the party’s nominee. She predicted Cruz will endorse Trump during his scheduled speech Wednesday, making a case that will turn around the objections raised by some of his supporters.